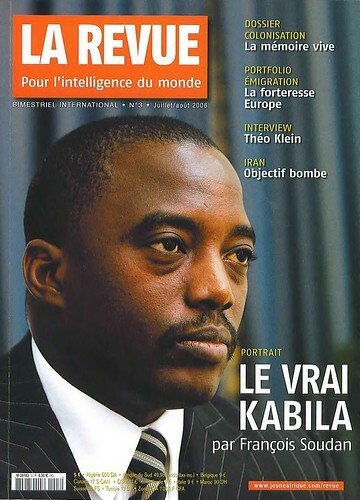 President Joseph Kabila on cover that reads "La Revue". The Democratic Republic of Congo held national elections in early December 2011. The central African state is a large repository of strategic minerals., a photo by Pan-African News Wire File Photos on Flickr. KINSHASA. — Congolese security forces repelled a wave of coordinated attacks in the capital Kinshasa and other cities on Monday, in fierce gun battles that left more than 100 assailants and three troops dead, the government said. Armed youths believed to be loyal to a pastor who challenged President Joseph Kabila in elections seven years ago stormed the state television station, the international airport and the military headquarters. A government spokesman said more than 103 attackers had been killed, 52 of them in Kinshasa, while three troops had died in the fighting in the capital. “Now we have to find out who the assailants are,” he said, as he inspected the sites targeted in Monday’s attacks. Ntambo sought to downplay the attacks, saying many residents of the capital “didn’t even notice anything was happening”. However, the United Nations said its troops in the conflict-ridden Democratic Republic of Congo had been placed on alert following the violence in the capital, the second city Lubumbashi, and the eastern town of Kindu. UN spokesman Martin Niersky said UN troops stationed at the airport had engaged the gunmen at the airport, where a staff member was wounded during the exchange of fire. The capital has by contrast remained relatively calm, apart from an apparent coup bid in 2003 blamed by police on troops loyal to ousted dictator Mobutu Sese Seko, who was overthrown by Laurent-Desire Kabila in 1997. The attempt was quickly quashed.